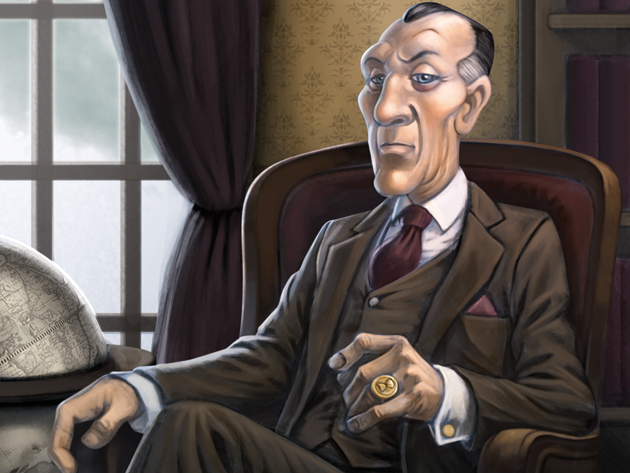 The second adventure in the series is called The Fate of London. In this cooperative game, everything is contained in a single card box – think the old traditional Amigo sized card game boxes. Contained within is a single 60 card deck. These cards are double-sized – that is each is 3.2 x 4.4 inches in size – like two traditional playing cards that have not been cut apart. 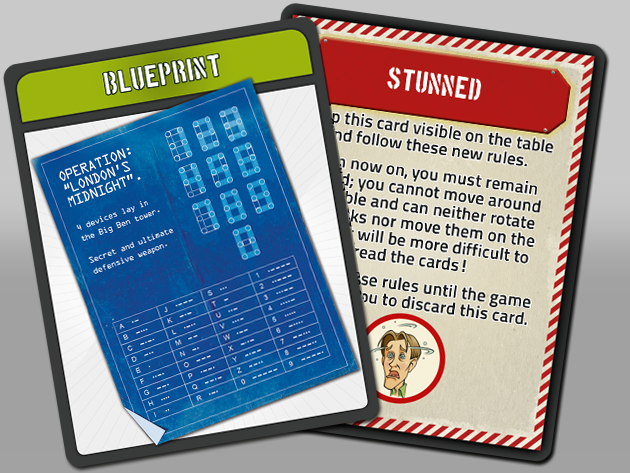 The larger size of the cards helps accommodate all the graphics and text needed for the game. 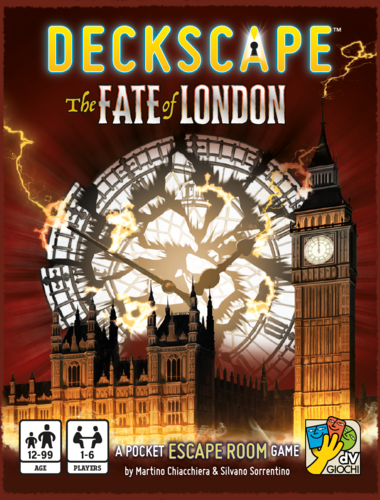 The story for this game goes as follows: In Deckscape –The Fate of London, an undercover agent has chosen you from the best Scotland Yard detectives for a top secret mission. A terrible threat hangs over London, and it is up to you to fix this problem! You have to find four devices hidden in secret locations and defuse them before midnight: a single mistake and the situation could degenerate. I’ll try to explain the game without any spoilers. 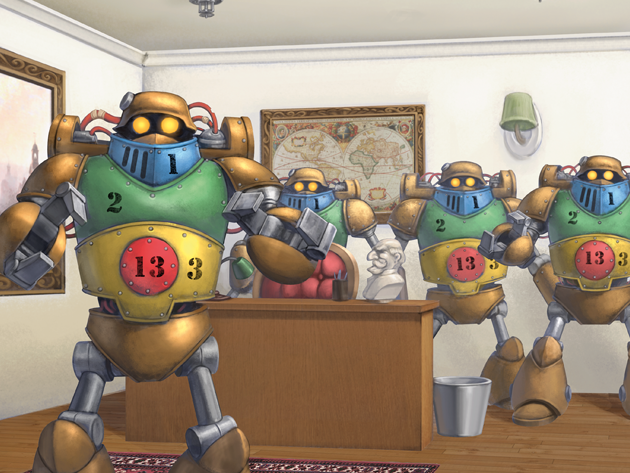 Once the scenario is set up with the first few cards, you will then be instructed to record the time to start the game in earnest… The goal of the game is to solve puzzles, understand the plot of the story, and make intelligent use of the items provided in order to get through all the cards in the box as quickly as possible. All of the information needed to solve the puzzles are found on the cards themselves, though you might want to have some pen and paper handy to make notes, etc. The solution process is fairly simple – when you think you have solved a puzzle, and all of the teammates agree on the possible solution, you flip over the card with that particular puzzle on it to see the solution. If you have solved it correctly, you simply keep reading the directions on the card and move on. Sometimes, the game will just have you go to the next card. Sometimes, the puzzle will provide you with an item which remains in your possession for the rest of the game.The item will probably be used to solve a puzzle later in the game, but you’ll have to figure out where/when to use the item. If you are wrong, you still get to progress to the next challenge, but you must make note of your failed solution on the scoring sheet. You’re on your honor to decide whether you’ve solved the puzzle correctly or not. When you make it through the deck of cards, there is a scoring rubric that you can use to determine how well you did. Essentially, you take the time needed to solve the whole set of puzzles with some time penalties added in for any incorrect solutions. Our quest to save London took a bit longer than the first episode in the series. We did get somewhat stuck on two of the puzzles in this box, and this caused us to have a longer playing time. The overall format was very similar, and the folks at dv Giochi have definitely found a system that works well. We felt that the level of difficulty of puzzles was OK – there were a few which seemed quite easy, and as I mentioned above, a few that took us a bit longer to work through. 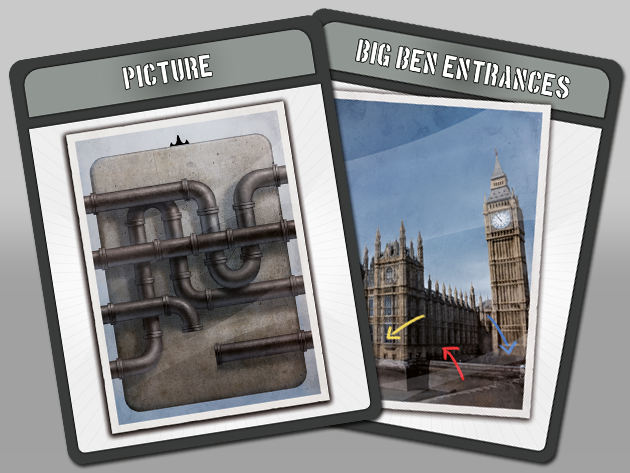 We did need to take a single hint on one of those puzzles – there are a few cards full of hints to help you get on your way if you get really stuck! – and the clue did help us get on the right track. I wouldn’t say that those puzzles were inherently unfair, but they seemed a bit gimmicky once we learned the solution (or maybe I should say that they required a gimmick in order to make them difficult…). I am glad to say that we did not encounter any typos on the cards themselves. The artwork was well done on the whole. If there was any issue with the game – it’s that it might be hard to play this with higher player counts. The reason for this is simply that though the cards are oversized, they are still not that big, and it’s hard to get so many heads around the card at one time. I’d probably personally limit the group to 4 or so. There are also plenty of times where there are multiple active puzzles. If you have a larger group, you could end up missing large parts of the overall puzzle if a different group gets through a number of puzzles while you’re working on something different. I’d also be careful picking up the cards to study them – because if you do, you risk possibly exposing the answer to the puzzle (on the reverse side) to anyone on the other side of the table. We definitely tried to make sure that we kept unsolved puzzles on the table to prevent accidental solving! As it stands now, the list price for this will be around $15. While you can only play it once, it was a fairly engaging hour for four gamers in our group and we felt it was well worth the cost for that amount of play. As I mentioned earlier, you really cannot play the game more than once, but you could then pass this on to a friend when you were done with it. I’m still looking forward to further releases in the line of puzzle games. The level of difficulty was good – and while we felt there were a few puzzles that were gimmicky – it provided a very nice discrete puzzle solving activity for one of our game nights and gave us an experience which we enjoyed doing. I wouldn’t say that this one was my favorite; I liked Test Time a little bit better.